Home » Articles - Disability, Life and Critical Illness » Mental illness and LTD benefits. Mental illness and LTD benefits. 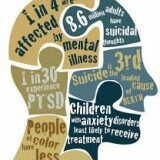 According to Health Canada, mental illness is the second leading cause of disability in Canada. In a 2008 article, the Institute of Health Economics reported that on any given week at least 500,000 employed Canadians are unable to work due to mental illness. Disability insurance claims involving mental illness make up nearly 40% of my practice. There are a number of unique challenges of applying for disability benefits involving mental illness. 1. The insurance industry sees your claim as a “problem”. Due to volume of disability benefits claims involving mental illness, the insurance industry has made “managing” mental health claims a priority. Insurers have developed a number of strategies to deny these disability claim, while maintaining the appearance of objectivity. There is little you can do about the insurance industry practices, but understanding how the insurance company acts will help you know what to expect, and allow you to make better plans. Focus on things that are in your control. For example, if the insurance company denies your claim, you have to weigh the pros and cons of appealing directly to the insurance company versus filing a lawsuit against the insurance company. In some situations, doing appeals with the insurance company (rather than a lawsuit) can be a complete was of time. 2. Mental illness is “invisible”. One of the challenges you face is that your illness, for the most part, is invisible. This is a problem for a number of reasons. When others can’t “see” the source of your disability, they may begin to doubt you. This includes your family and friends, as well as the insurance representatives, and possibly even your lawyer (if he or she is uninformed about mental illness). Insurance companies have concerns that mental illness is too easy for people to “fake” because it can’t be objectively identified on an x-ray or other medical test. If you choose to file a lawsuit for payment of long-term disability benefits, it is important that you choose a lawyer who understands mental illness, and how it can impacts you in your day-to-day interactions. I often have to educate lawyers to be more understanding of their clients with mental illness. Many behaviors that lawyers would associated with a person being a “bad client” (e.g., anxiousness, anger, being non responsive to calls or emails) are often just an expression of the illness. In my experience, conflict with an insurance company will usually worsen anyone’s mental illness. Insurance companies will often approve disability claims involving mental illness for the short term. It is important that you understand this so you can better prepare yourself and not be caught off-guard by the termination. For example, the insurance company may approve your claim for 15 weeks of short-term disability benefits, but then deny your claim for long-term disability benefits. Many claims will get denied at the outset or within the first year because of deficiencies in your medical care or how the medical care is documented. Another common scenario is that the insurance company will approve your long-term disability claim for two years, but then terminate your benefits at the two-year mark. This happens because many long-term disability policies have two definitions for eligibility for disability benefits. The first definition (called the “own occupation” period) applies for the first two years and usually says you will qualify for benefits if you can’t do your own job. The second definition runs from two years on (called the “any occupation” period) and says you will qualify for benefits only if you can’t do the essential duties of any job. When the insurance company terminates benefits at the two year mark, they usually argue that you can do other, less stressful work. 4. Surveillance & Social Media. Insurance companies routinely hire private investigators to get undercover video surveillance of people receiving disability benefits. This is especially true in claims involving mental illness. The most common time for surveillance is early in the own occupation period (within the first year of you being approved for benefits). The insurance company’s goal is to get video of you leaving the house; running errands; and doing daily activities. They then use this video as the basis to terminate your benefits on the basis that, if you are well enough to go to Tim Horton’s once per day, you should be able to go back to work. Social media is latest hot spot for insurance company surveillance. They see this as a gold mine of information upon which they can rationalize a denial of your benefits. If you have a publicly accessible social media page (e.g., Facebook, Pinterest, personal Blog, etc. ), there is a very good chance the insurance company is watching it, and printing off the pages of your photos and whatever you write. There are now private investigators that specialize in online surveillance (including Facebook, Pinterest), and insurance companies often hire these people get information they can use to justify a denial of your benefits. Given all this video and online surveillance, clients often ask me what they should do? My advice is always the same – do not live your life worrying how it will “look” to the insurance company. Focus on doing whatever it takes to feel better and to improve your health. Live your life to the fullest, do your best to get better, and listen to your doctor and other treating professionals. I know that many lawyers tell their clients to stay off social media and to shut down their Facebook accounts. I think this is a mistake.With mental illness often the worst thing you can do for your recovery is to isolate yourself at home and to stay away from social media. Do not concern yourself with what the insurance company will think because they will argue you are faking no matter what you do. The more active you are and the harder you try to get back to work, the better it is for your case against the insurance company. If you can get back to work, great! But if you can’t, the judge will respect that you tried your best. Don’t be surprised if the insurance company continues to deny payment of benefits, even after your family doctor or psychiatrist has written a letter (or multiple letters) confirming you cannot work. I actually see this all the time in my practice. What is happening in most cases is that a doctor (who has never met you) is advising the insurance company behind-the-scenes. This doctor, usually a psychiatrist, will review the medical documents you have provided the insurance company, and will criticize or second guess your doctors, and state that he or she disagrees that your symptoms are severe enough to cause disability from the workplace. With this behind-the-scenes medical opinion in hand, the insurance company has the justification it needs to deny or terminate your benefits. You will never know that they have such a report from a doctor, because they will not provide it to you or your treating doctors. Once you bring a lawsuit against the insurance company they have to disclose these scenes medical reports to you. 6. Not getting proper medical treatment or not having your treatment properly documented are the main reasons your disability benefits will be denied. getting quality treatment, but it isn’t being properly documented by the doctors. Depression, anxiety and other mental illness are the second leading cause of disability from the workplace in Canada. The insurance industry sees the high number of disability claims as a problem and have a number of strategies to deny your application or to terminate your benefits, while creating an appearance of objectivity. Recognize that the nature of your illness will make it difficult for you to effectively manage your application and interactions with the insurance company on your own. Get help early, as you are more likely to get overwhelmed, and suffer an increase in severity of symptoms due to conflict with the insurance company. When choosing a lawyer, make sure he or she is educated and informed about mental illness and what it means for you in your interactions with the lawyer. Lawyers who do not understand your illness may wrongfully believe you are a “bad client” when your symptoms of anxiety or depression interfere with your ability to function. Keep in mind that even if the insurance company approves payment of benefits, they will likely seek to terminate payment within two years. Prepare yourself for this to happen and watch for the writing on the wall. Once you sense the insurance company is taking steps to terminate your benefits, consult a lawyer as soon as possible if you have not already done so. Once the insurance company denies your application, or terminates your benefits, act quickly to bring a lawsuit against them for payment of benefits. Do not waste your time with the internal appeals process as there is very little chance of success and it will likely only worsen your symptoms.